Mirrors are definitely one of those household wares that we occasionally find ourselves in excess of but that we just don’t have the heart to throw out. 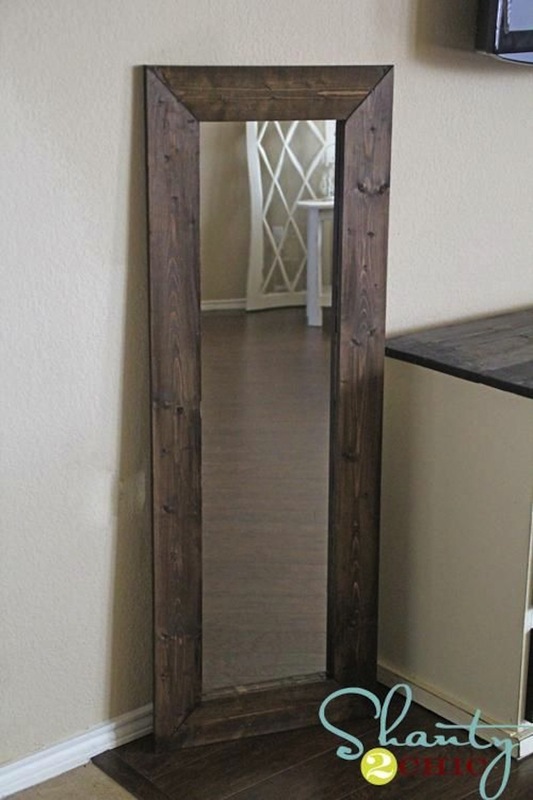 Sure, we might never use that plain, undecorative mirror that’s been sitting in the garage and not even hung on the wall for years, but would we use if it it looked unique, stylish, or matched our decor? The answer is definitely yes and that’s where our DIY skills come in to save the day. 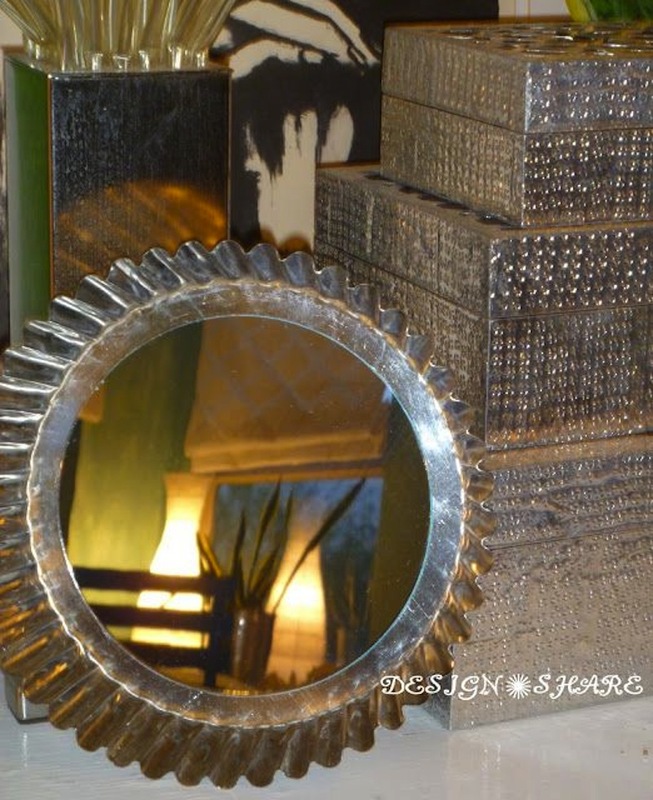 Check out these 15 awesome projects that let you craft with old mirrors in a way that gives you an exciting new decor piece! 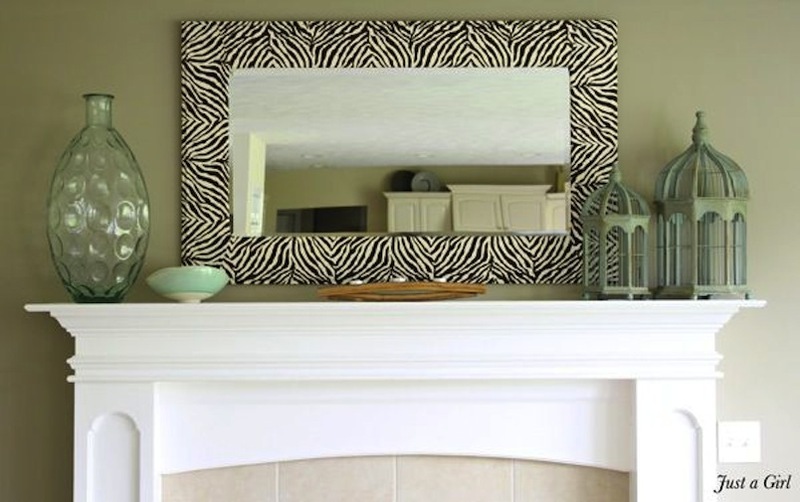 Do you love the idea of adding a frame to your mirror to make it into an awesome decor craft but you don’t want to spend lots of money on the project? Then Thrifty and Chic has one awesome option for you to try! 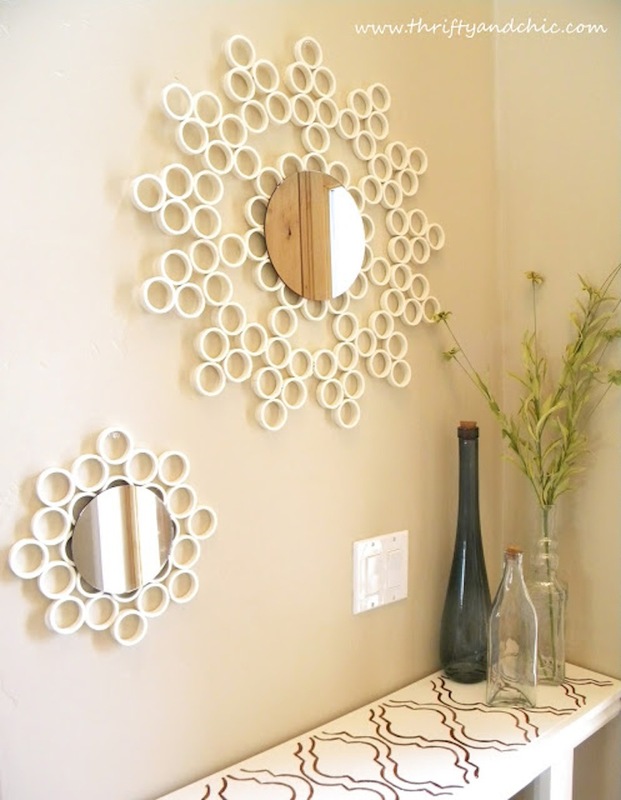 They cut rounds of affordable PVC piping into thin circles and arranged them stylishly around the outside of the mirror. You could get as subtle or as crazy as you please with your layers. 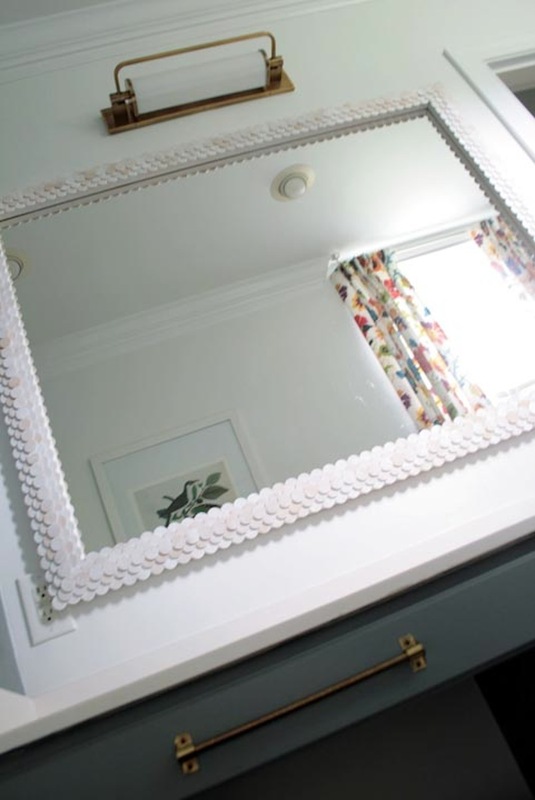 We love the way this mirror craft upcycles both an old mirror and some plastic spoons, but also that it lets you play with colour a little bit! This chrysanthemum inspired design from Addicted 2 Decorating is stunning as it is, but you’d have no problem changing the colour of ombre and doing it in shades of purple or pink instead, for example. Do you feel like getting even crazier with it? Paint every spoon a different bright colour and make it a rainbow! Did you love the shape of the rounded PVC pipe pieces idea we talked about above but the white plastic just doesn’t go with your personal aesthetic or your current decor scheme? Then try using the same technique but with a different material! That’s My Letter suggests making a rounded layered mirror frame from thinly cut slices of a wooden branch instead. We love the way they’ve filled in the outer edges with small circlettes from the thinner end of the branch. 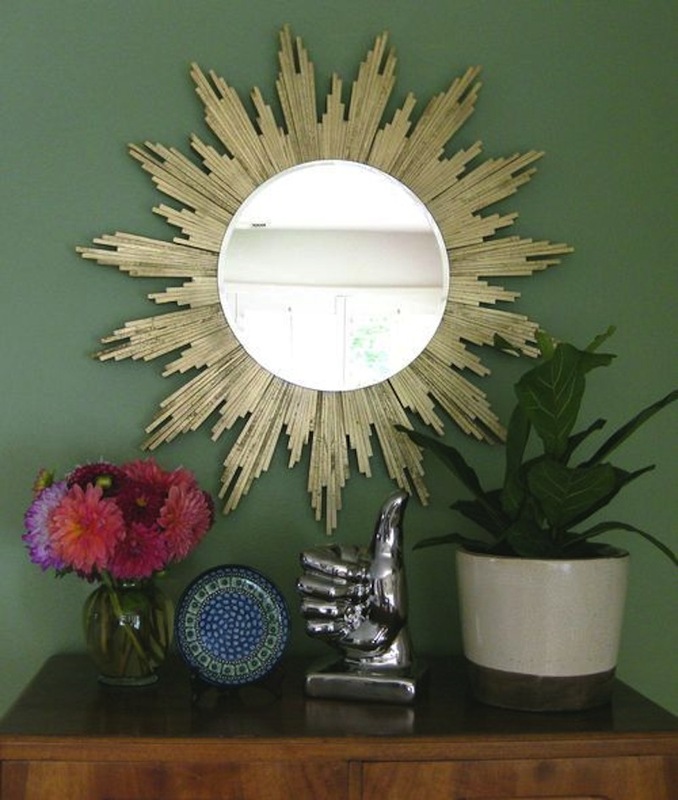 If you’re working with a round mirror and you like the idea of adding a frame to it but you’d prefer one that’s not also rounded, check out this starburst design from K Sarah Designs! 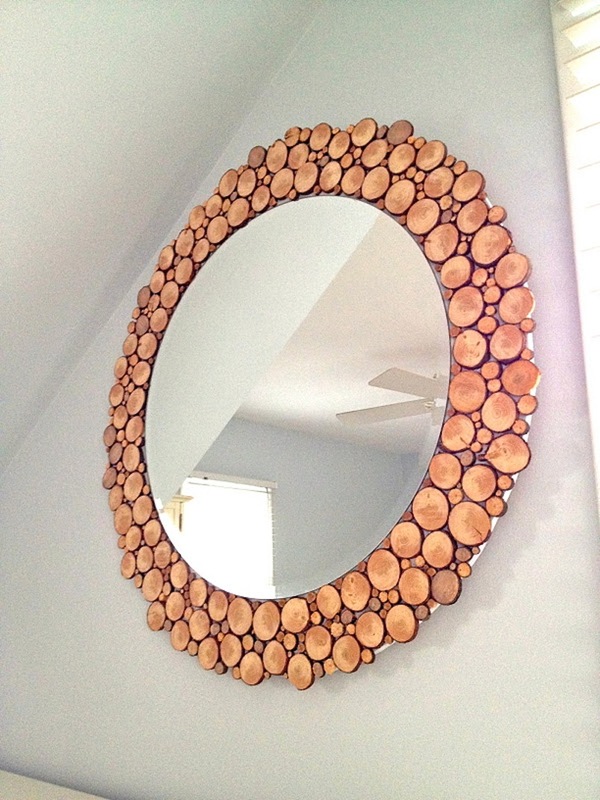 The straight out and slightly jagged look of the wooden shims they used contrasts well with the rounded shape of the mirror itself, making the entire piece stand out more when you hang it up! If you’re going to craft with something and get creative, do you prefer to do it with something a lot more unconventional, just to really make sure the piece gets noticed by visitors when you put it on display? Then this yellow school pencil design might tweak your interest! We’ll admit that, even though we craft almost constantly, we don’t often come across too many projects made with writing utensils. See how it’s done on Mosaic Works. If you’re going to put an old mirror to use then maybe it’s worth putting something else you don’t use around your house to use as well? Sometimes when we want to upcycle, we raid the kitchen cupboards because ours are like a goldmine of things we think will be useful someday but that we end up never touching again. 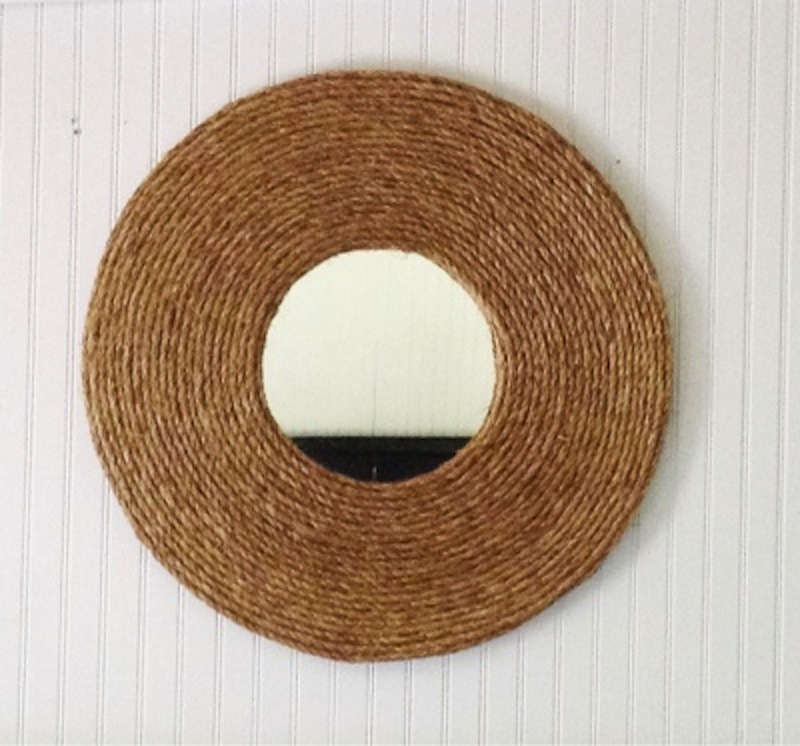 That’s how we actually ended up making this very DIY framed mirror by Design Share! It’s made using an old corrugated angel food cake pan. Did the idea of crafting with unused school supplies really intrigue you when we talked about the pencil mirror, but it’s not pencils that you have an abundance of lying around? Then check out this awesome ruler alternative concept instead! 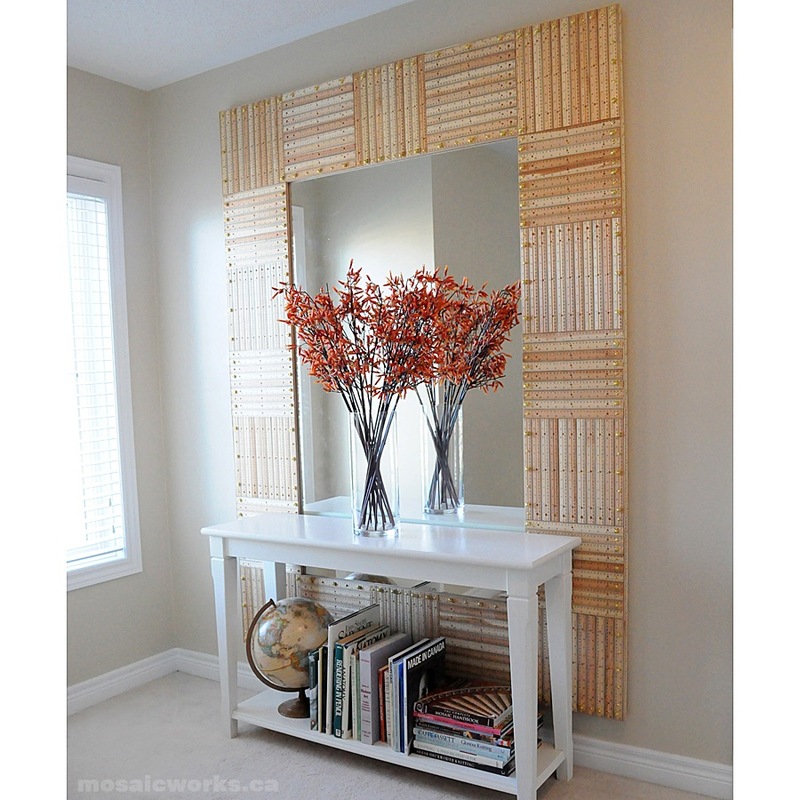 Mosaic Works shows you how to built an entire framed grid of rulers in alternating directions around the outside of the mirror for a cool visual effect that’s perfect for a household of teachers. Do you have a steady hand, a lot of patience, and a taste that’s a little more reserved than bright yellow pencils and contemporary layers of circles calls for? Then check out this simple tiled mosaic idea from Sand and Sisal and consider something with this kind of detail instead! We love that the tiles vary in colour and texture throughout the mosaic. Do most of your DIY projects and skills actually lie in the world of sewing and fabric work, but you’re looking for something new and interesting to try? 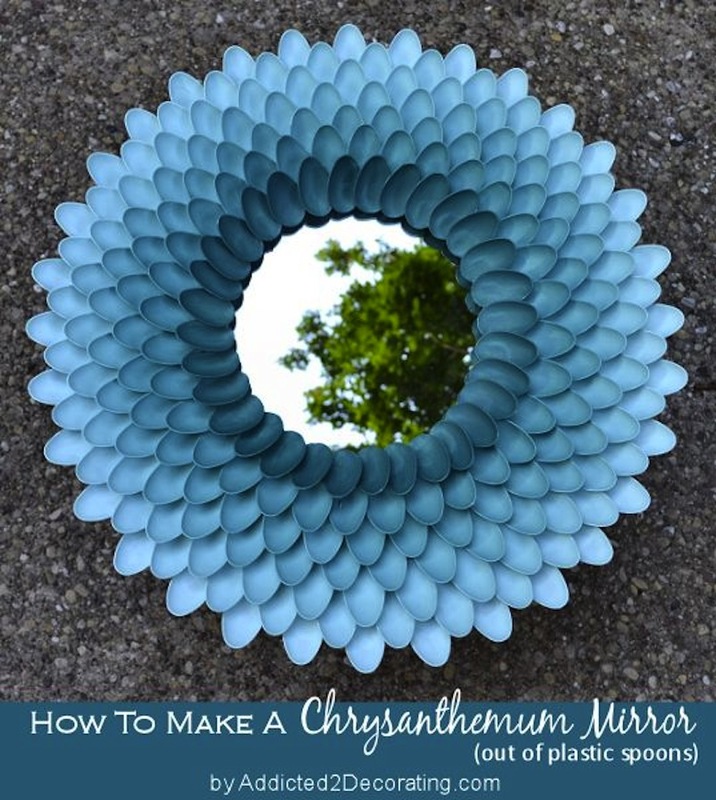 Then branch out a little to make a mirror craft but keep your strengths and supplies in mind! We simply adore this eye catching zebra fabric frame from Just a Girl, but we think it would look neat in other colours and patterns of fabric as well. Were you perusing this post hoping to find a mirror craft that would match your house or cottage in a rustic chic kind of way? We’re always big fans of things that somehow manage to look stylish but down-home and well loved at the same time. That’s why we’re such big fans of The Shabby Creek Cottage‘s coiled rope idea! Glass etching and glass frost stenciling are wonderful techniques because they can be used on so many different surfaces. We’d done them both on drinking glasses, upcycled bottles, and reused mason jars before, but did you know you can do them on the surface of mirrors as well? 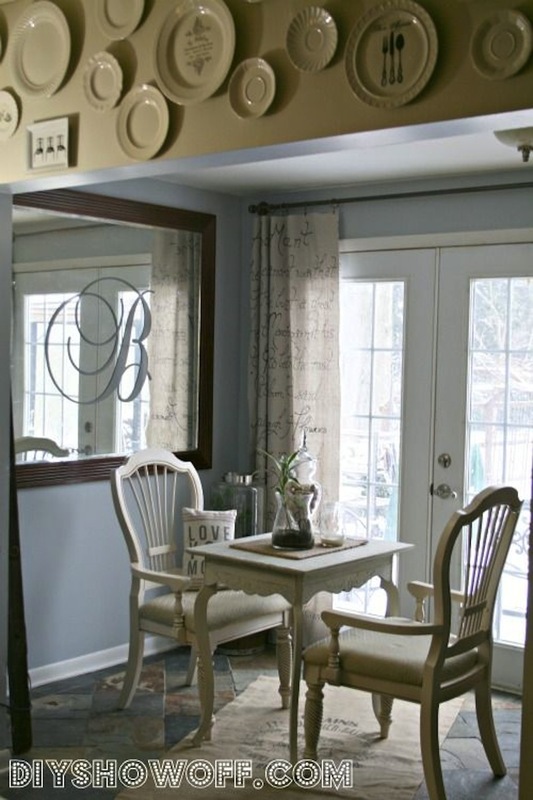 DIY Show Off guides you through the process of monogramming a big wall mirror in a way that customizes it for your home. Remember when we were talking about crafts that suit people with more time and patience who have a steady hand? Well, just in case that sounds like you but the previous design didn’t quite keep your attention, here’s another mosaic style mirror for you! 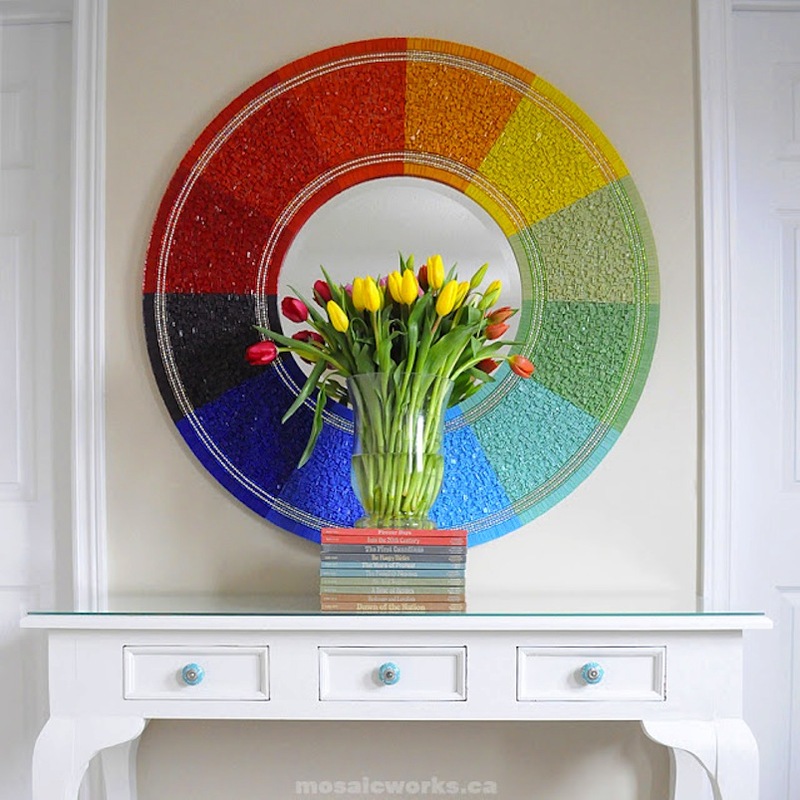 Technically you could create a rounded colour variegation frame using any shades, but we simply adore the way Mosaic Works created a rainbow colour wheel around theirs. Perhaps you’re looking to make yourself an upgraded mirror, but you’re really not set on anything too complicated or fancy? Then you might be happy with a simple technique and an affordable project just like this rustic wooden frame by Shanty 2 Chic! Their tutorial shows you how easy a bit of wood working can be even if you don’t have a whole set of handyman skills in your metaphorical DIY tool belt. Have you, by some strange lead of events, ended up with shaped mirrors that don’t actually reflect image very well? You can still make decor out of them to harness the cool effect they do give off, rather than to take advantage of their reflection itself! 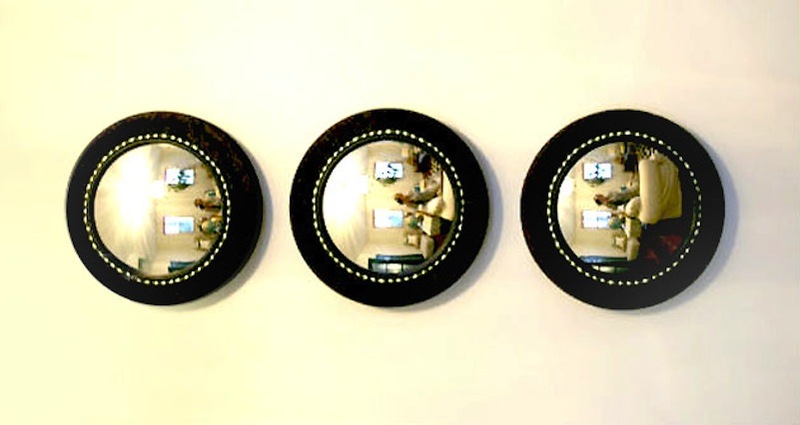 We love how DIY Show Off created chic foam circles for these convex mirrors to nestle into, give the wall a contemporary feel even though the image looking back at you isn’t straight. Were you almost hooked on the previous wooden circle design we showed you, but you’d rather something a little more contemporary and a little less natural looking? Then follow in Southern Exposure‘s lead and cut small pieces of wooden dowels, painting them however you please before you layer them around the outside frame of the mirror. 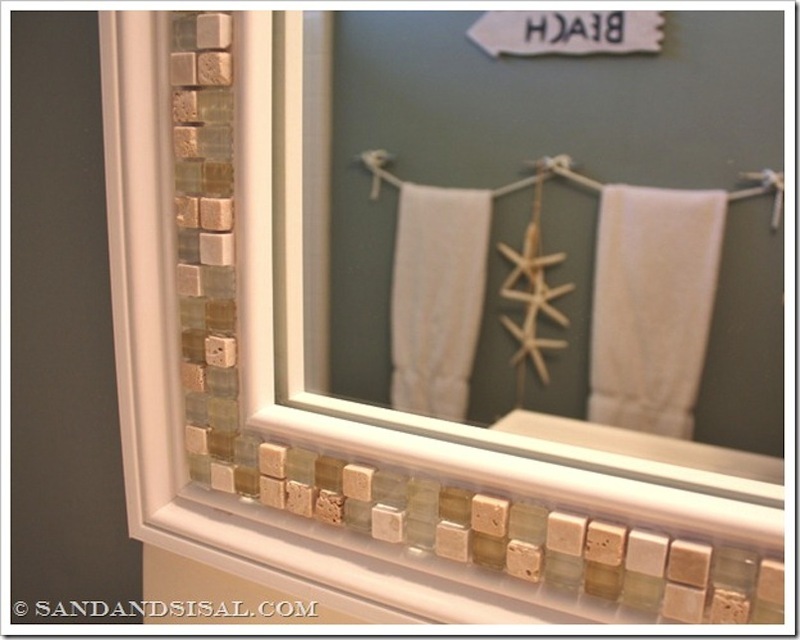 Have you made other mirror crafts that you were very pleased with, but that you don’t see on our list? Tell us all about how you did it in the comments section! The post Crafting With Mirrors appeared first on DIYs.com. My new window nook / reading corner!